Location: Kingsgate Bay, Broadstairs, Kent, England. Notes: Kingsgate Castle on the cliffs above Kingsgate Bay, Broadstairs, Kent, was built for Lord Holland (Henry Fox, 1st Baron Holland) in the 1760s. 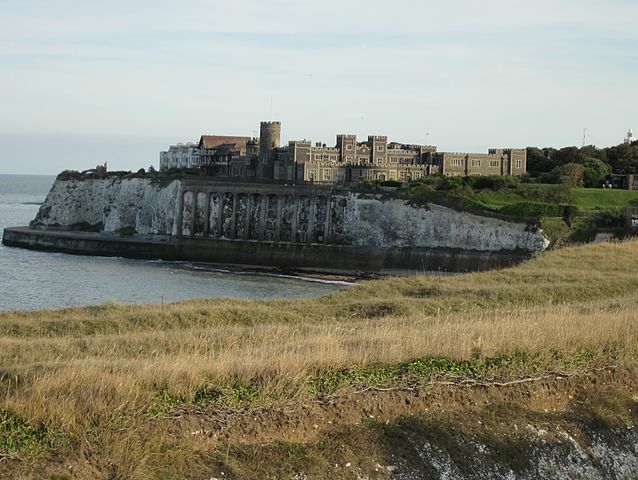 The name Kingsgate is related to an incidental landing of Charles II on 30 June 1683 ('gate' referring to a cliff gap) though other English monarchs have also used this cove, such as George II in 1748. The building was later the residence of John Lubbock, 1st Baron Avebury. The building has now been converted into 31 flats.